Condition statements are used in Mini Mouse Macro to add choices to your running macro, to evaluate the environment and to direct the flow and control of your macro. An IF condition is checking or asking IF the statement evaluates to TRUE or that the condition is correct. This reads - IF the FILE c:\MMM\skip.mmmacro exists then CONTINUE the macro. So if the file does exist then the macro will continue. An IF NOT condition is checking of asking if the statement is NOT TRUE of if the condition equals FALSE. This reads - IF NOT the FILE SIZE of c:\MMM\skip.mmmacro is 2929 bytes then STOP the macro. So if the size of the file is not 2929 then the macro will stop playing. A RUN ACTION condition does not perform any condition evaluation or checking it simply runs the action selected. In Mini Mouse Macro a FOR condition allows for flow control through iteration (looping) of files within a single folder or many nested folders, or iteration toward a set numerical value. There are two types of FOR loops that can be used for flow control. The FOR EACH loop and the FOR I loop. This FOR loop iterates through each file in a folder. For every file in the folder, the FOR loop will DO a set of actions or evaluations that are listed within the FOR block. In the above example there is one action within the FOR block, line 2. This FOR loop will execute the MESSAGE PROMPT action on every file iteration in the E:\DOCS directory. A file iteration takes place when the macro line reaches the closing FOR block; line 3 in this example is the closing FOR block. This macro will iterate (loop) through all the files in the directory of E:\DOCS one at a time, performing the action at line 2. When all the files have been iterated then the FOR loop ends and the macro continues. The example above loops through the files in the E:\Docs directory. If the file extension (internal variable %FILE.EXT%) of the file is .txt then increment the %INTEGER% variable by one. When the loop ends (at line 4) then display the value of %integer% in a MESSAGE PROMPT. The FOR EACH FILE IN -R loop recursively iterates through each file in every directory within the chosen path. Like the standard FOR loop above, the FOR loop will DO a set of actions or evaluation that are listed within the FOR block. In the above example there is one condition evaluated against each file recursively within the E:\DOCS directory tree. Line 2 performs a string comparison to evaluate the value of the current variable %FILE.EXT% (the file extension of the file within the FOR loop iteration). IF the value IS NOT .aes then perform the action to ENCRYPT FILE %FILE% (the variable containing the current file within the FOR loop iteration). The above macro nests an additional FOR EACH LINE IN loop. This macro recursively iterates through the E:\docs directory and for each line in the current file within the loop it performs a string comparison (IF STRING VARIABLE %LINE% CONTAINS) to determine if the current line does contain %date% - Out. If the %line% value does contain the text then (OUTPUT TO FILE) append to E:\out.txt the text %file%;. The FOR EACH LINE IN FILE DO loop iterates through each LINE in a FILE and performs (DO) a set of actions or evaluations that are listed within the FOR block. LINE IN FILE works well with text based files however may not perform as expected with others (AUG 18). The above macro reads through each line in send.txt performs the condition statements at line 2 and 3. At line 4 the FOR LOOP begins the loop again until each line in the file has been read. This macro sends a ping to the value (NETWORK HOST PING REPLY) of %line% (the current line value). If a successful ping reply it then sends a UDP packed (SEND UDP PACKET STRING) to the value of %line% on port 41414 with the string 'BEGIN'. Line 4 waits 30 seconds for a UDP reply from %line% on port 41413 (RECEIVE UDP PACKET STRING) with the string 'FIN'. If a reply comes in that time frame with the string 'FIN' then it appends (OUTPUT TO FILE) to the file hostRX_110.txt the text value D.%date%.T.%time%.Success_. The FOR EACH LINE IN FILE RUN steps through each line in a file, parsing it directly to Mini Mouse Macro to run. This works best with saved .mmmacro files. Regardless of file extension, Mini Mouse Macro expects the same format as a saved .mmmacro file with macro conditions. Also, this works best for macro files that contain no flow control. Mini Mouse Macro can not redirect flow control within these files. For example, FOR loops within this file will not work and GOTO statements will not work. This macro steps through each command in each .mmmacro file listed. Line 2 will begin when all the lines in commands1.mmmacro has executed. The FOR I = NUM to NUM NEXT loop is a classic FOR counter loop. This loop steps from the first number to the last number by the value of 1. The value for the numbers can be any variables that can contain numbers (%INTEGER% TO %INTEGER1% or %STRING% TO %STRING1% or %CLIPBOARD% TO %RANDOM_5-10%) or can be set to numbers (1 TO 50). The macro above counts up from 130 to 150. Each count increment it performs the condition at line 2. Line 2 pings the host 10.0.0.%i%. %i% is the internal variable that holds the current count value. If the ping is successful the macro writes out to d:\macro\rx\hosts.txt with the value of %i%,. ELSE is used with either IF or the IF NOT conditions to allow further evaluation to continue if the condition does not evaluate to TRUE. To put it another way, ELSE can be thought of as 'otherwise do this' if the first condition fails. An ELSE condition can not be used when the initial condition has the CONTINUE action. This is because with the CONTINUE action the condition must evaluate to TRUE prior to continuing the macro. So if the file C:\MMM\Skip.mmmacro does EXIST then the macro will GOTO MACRO LINE 5 but if the file does not exist then RUN the ACTION to GOTO MACRO LINE 2. Here if the first condition evaluates to false, the file does not exist, then the second condition will be evaluated. Create your initial IF or IF NOT condition - do not click ok.
Now select either IF, IF NOT, or RUN ACTION condition - This will add the condition after the ELSE. Select your OBJECT - this will add an object condition after the condition. Now complete the ELSE line by selecting the OPERATOR and ACTION. It is best to follow this procedure for each ELSE condition added. AND is used to add further actions and conditions to macro lines once they evaluate to TRUE. This reads: If the file output.txt does EXIST then run the MESSAGE PROMPT, AND also run the action to OUTPUT TO FILE output.txt the variable %STRING%. In this example if the file output.txt did not exist then the AND action would not run. This example, the same as the first with ELSE added, will execute the last MESSAGE PROMPT if the file output.txt does not exist and will skip the AND statement. Note: That AND actions or conditions only run if the leading statement in the ELSE block evaluates to TRUE or is successful. Note: That AND actions or conditions do not add aditional condition evaluation to a macro statement. For example in the typical use case below notice how AND is used to combine multiple macro line statements into one line. Objects are the focus of your condition. An object is an item that you would like to evaluate with an IF or IF NOT condition statement. FILE and FOLDER objects evaluate conditions based on the state of file and folders on the system. This reads - IF the FILE c:\tasklog.log does EXIST then DELETE the file c:\tasklog.log. So the file c:\tasklog.log will be deleted if it does exist on the system at that location. Files are deleted permanently and not sent to the recycle bin. This reads - IF the FOLDER does NOT EXIST then GOTO MACRO LINE 5 and run . So if the folder does not exist then the macro will start running at macro line 5. FILE SIZE and FOLDER SIZE objects evaluate conditions based on the size in bytes of files and folders on the system. This reads - IF the FILE SIZE of c:\tasklog.log is GREATER THAN 96 bytes then CONTINUE with the macro. So the file is larger than 96 bytes then continue running the macro. NOTE that with CONTINUE actions the macro will wait until the condition evaluates to true or matches before continuing. So in the case of the example if the file is not greater than 96 bytes then wait until it is. This reads - IF the FOLDER SIZE of folder c:\MMM is 17574 bytes then load the macro from c:\MMM\Skip.mmmacro. So run the macro Skip.mmmacro if c:\MMM is exactly 17575 bytes in size. NOTE that a root folder that is very large in size may take time to evaluate the size condition. FILE MD5 HASH objects evaluate condition based on the resulting MD5 cryptographic hash outcome of a file. An MD5 hash is a one way mathematical algorithm that produces a fixed size output from a value, in this case the output from reading in a file. MD5 hash values are used to check the integrity of files. If the file has been changed then the MD5 value is also changed. This reads - IF the FILE MD5 HASH of c:\rescue.log is bfe75d55a12df081a06e463eefc7f0c5 then WAIT SECONDS 30. So the file MD5 hash matches then wait 30 seconds before continuing running the macro if the MD5 does not match then the continue without running the action. FOLDER FILE COUNT objects evaluate condition based on how many files are in the folder. NOTE that this is recursive. Meaning all files within all folders within the folder. This reads - IF the FOLDER FILE COUNT within the root folder c:\MMM is 6 then RUN PROGRAM c:\Windows\notepad.exe. So if there are 6 files within the folder tree of c:\MMM then run the program c:\windows\notepad.exe. PROCESS NAME and PROCESS ID objects evaluate conditions based on the current status of the system process ID or process name at the time of execution. This reads - IF the PROCESS with the NAME of notepad does EXIST then SELECT WINDOWS BY NAME the windows name Untitled - Notepad. So if currently there is a system process called notepad that does exist then select the windows entitled Untitled - Notepad, the default name of a new notepad document. After either Process name or Process ID are selected as an Object a combo box will appear with all the current system process names or ID's to select from. TIME objects evaluate condition based on the current system time. NOTE that TIME values are in 12 hour time format. This reads - IF the TIME of 2:00:56 PM is the current time then CONTINUE. So if the time when the condition is evaluated is 2:00:56 PM then continue running the macro, otherwise wait until that time and then continue. This reads - IF the TIME of 2:04:09 PM IS BEFORE the CURRENT TIME then GOTO the MACRO LINE 1. So if the current system time is before 2:04:09 PM then the macro will be redirected using the GOTO action, to macro line number 1. If the time is not before, then this condition is skipped and the macro continues the next line. This reads - IF the TIME of 2:07:10 PM IS AFTER the CURRENT TIME then RESTART the COMPUTER. So if the current system time when this macro condition is evaluated by Mini Mouse Macro is after 2:07:10 PM (for example it is 2:10:00 PM) then the computer will be restarted. If the time is before this time then this condition is skipped and the macro continues to the next line. DATE objects evaluate condition based on the current system date. This reads - IF the DATE of 6/25/2016 is the current system date then STOP. So if the date when the condition is evaluated is the same then STOP the macro, otherwise continue that macro. This reads - IF the DATE of 6/25/2016 IS BEFORE the CURRENT DATE then DEFINE INTEGER VARIABLE to be the current value + 1 (Integer variables are covered below). So the date value of 6/25/2016 is before the current system date, for example 6/28/2016, then the define integer variable action will be run. If the current system date is not before 6/25/2016 then the condition will be skipped and the next macro line entry will be evaluated. This reads - IF the DATE of 6/25/2016 IS BEFORE the CURRENT DATE then CONTINUE. So if the date value of 6/25/2016 is after the current system date, for example 6/20/2016, then continue to run the macro. If the current system date is not before 6/25/2016 then the condition will wait until the date is after the current system date and then it will continue. TIME AND DATE objects evaluate condition based on the current system time and date. This reads - IF the TIME AND DATE of 14:25:30 25Jun2016 is the current time and date then CONTINUE. So if the time and date when the condition is evaluated is the same then the macro will continue. If the current system time and date is not 14:25:30 25 June 2016 then the macro will wait until it is before continuing. This reads - IF the TIME AND DATE of 14:25:30 25Jun2016 is BEFORE the current time and date then WAIT 12 hours and continue. So if the time and date value of 14:25:30 25Jun2016 is before the current system clock time then the macro condition will be true and the action to wait 12 hours before continuing will commence. If the current system time and date is after 14:25:30 25 June 2016 then the macro condition will be false and the action will be skipped allowing the macro to evaluate the next macro item. This reads - IF the TIME AND DATE of 14:30:00 25Jun2016 is AFTER the current time and date then DEFINE the STRING VARIABLE to 14:30_25 JUNE 2016 (String Variables are covered in the section below). So if the time and date value of 14:30:00 25Jun2016 is after the current system clock time then the macro condition will be true and the action to define the %string% variable to the text 14:30_25 JUNE 2016 will execute. If the current system time and date is before 14:30:00 25 June 2016 then the macro condition will be false and the action will be skipped allowing the macro to evaluate the next macro item. KEYBOARD KEYPRESS objects evaluate condition based on a keypress at the time of evaluation. This reads - IF the KEYBOARD KEYPRESS is \ then CONTINUE. So during the time of condition evaluation when the key '\' is pressed then continue the macro. The macro will wait until the key is pressed before continuing. Only single key presses are evaluated at this stage. Keyboard Keypress is best implemented with the CONTINUE action. With the continue action the macro will wait for the key to be pressed to continue. Without the continue action the evaluation of the keypress is done at runtime only one time and can be missed. MOUSE POSITION EQUALS object evaluate condition based on current position of the mouse during evaluation. This reads - IF MOUSE POSITION EQUALS X=940 Y=517 LESS THAN the current mouse position then CONTINUE. So if the current mouse X position or Y position is LESS than X 940 OR less than Y 517 then continue playing the macro, otherwise wait until the mouse is less than X 940 and Y 517. The CONTINUE action allows an object to only evaluate once a match has been made. Any other actions will evaluate the condition at the time of condition execution. This suites both Mouse Equals and Mouse Near objects. MOUSE POSITION NEAR object evaluate condition based on if the current mouse position is near (within +50 or -50) of the mouse position during evaluation. This reads - IF MOUSE POSITION NEAR X=996 Y=523 is the current mouse position then CONTINUE. So if the current mouse X position or Y position is within +50 or -50 X or Y of X 996 or Y 523 then continue playing the macro, otherwise wait until the mouse is within the range. This reads - IF MOUSE POSITION NEAR X=996 Y=523 is not within the current mouse position then CONTINUE. So if the current mouse X position or Y position is NOT within +50 or -50 X or Y of X 996 or Y 523 then continue playing the macro, otherwise wait until the mouse is out of the range. NETWORK HOST PING REPLY objects evaluate conditions based on ICMP reply status; if they can be reached on the network. This reads - IF NETWORK HOST PING REPLY to ip address 192.168.0.2 is SUCCESSFUL then RUN VIA CMD /K the command NET USE X: \\192.168.0.2\share. So if the network host 192.168.0.2 is reachable on the network by PING (ICMP packets) then run a command from a command line window to map a network drive and keep the command window open. NETWORK PACKET DETECTED objects evaluate conditions based on network packets read from a local interface during the time of evaluation. After the Network packet detected object is selected a combo box is presented with the current names of all system network adapters. Select the network adapter to read packets from then select the operator value. This reads - IF NETWORK PACKET DETECTED from WIFI adapter of the SOURCE ADDRESS 192.168.0.2 (during 10 seconds) is detected then LOAD MACRO c:\MMM\NetworkFind.mmmacro. So if any network packet during evaluation read from the adapter named WIFI is from the source 192.168.0.2 then load the macro, otherwise wait until a packet is received and then load the macro. This reads - If NETWORK PACKET DETECTED from the Ethernet adapter does CONTAIN the STRING "LoadMacro" (within 30 seconds) then run the action to LOAD MACRO b:\mmm\Connect.mmmacro. If this condition does not detect the packet string then ELSE run the action to load the macro startprocess.mmmacro. RECEIVE UDP PACKET STRING objects evaluate conditions based on the string contents of UDP packets read during the time of evaluation. Sending and receiving UDP strings is a way of controlling Mini Mouse Macro over the network. The MMM Controller tool can be used to send commands to Mini Mouse Macro and to receive feedback from Mini Mouse Macro over a network. The MMM Controller can be downloaded here. This reads - IF RECEIVE UDP PACKET STRING from ANY IP address on UDP port 41414 that contains the string 'StartMacro4" (within 20 seconds) then SEND UDP PACKET STRING containing string "LoadMacro5" to IP address 192.168.0.2 on UDP port 41414. So if a UDP packet is detected on port 41414 with contains the word "StartMacro4" then send a UDP packet to IP address 192.168.0.2 on port 41414 that contains the word 'LoadMacro5". Note that RECEIVE UDP PACKET STRING conditions only continue once they evaluate to true. Conditions can be skipped by clicking on the ...Condition link at the bottom of the macro list. TCP PORT OPEN objects evaluate conditions based on the state value (open port or closed port) of a selected remote (or local) TCP port number. To determine the state of a port, MMM initiates a connection to the host on the chosen port. If the connection is successful within the timeout value the port is considered to be open. If the connection is unsuccessful (no reply is received) within the timeout value the connection is considered to be closed. This reads - IF the TCP PORT number 41414 IS OPEN on the host of 192.168.0.2 (wait 200 ms for a reply) then perform the action to SEND a UDP PACKET to 192.168.0.2 on port 41414 containing the STRING of LoadMacro5. This reads - IF the local host on 127.0.0.1 TCP PORT of 80 IS CLOSED (wait 100 ms for a reply) then do a MESSAGE PROMPT with the text of 'The local web server on port 80 is CLOSED' and the title of 'Port Closed'. ﻿STRING VARIABLE objects evaluate conditions based on the value of the local %STRING% variable in use with Mini Mouse Macro. Variables can also be defined and saved within the 'Variables' page in SETTINGS. ere the string variable is defined as StartMacro1. More information on define a string variable is available under the ACTION section and the heading ﻿DEFINE STRING VARIABLE﻿. This reads - IF the STRING VARIABLE %STRING% IS StartMacro1 then DEFINE STRING VARIABLE, %STRING%, to be the text Macro1Process. So if the current string variable (hard coded as %STRING%) matches exactly (evaluations are case sensitive) then change and define the variable to be Macro1Process. This reads - IF NOT the STRING VARIABLE, %STRING4%, does CONTAIN the text Macro1 then DEFINE INTEGER VARIABLE, %integer1%, +5. So if the current string value of %STRING4% does not contain the text of Macro1 in succession anywhere in the string then add 5 to the integer variable %integer1% value (integer variables are covered in the section below). Variables can be used for each elements of the macro entry. This provides a greater level of control of macro entries during macro playback. * | This simple macro moves the mouse X and Y pos incrementally 100 times. This reads - At X mouse position 2409 and Y mouse position 790 wait 200 milliseconds and they output words "My string variable is equal to %STRING%". So at that X and Y mouse position the value of the %STRING% variable will be typed with the text My string variable is equal to %string%. This reads - IF the FILE D:\Macro\MMM_10.txt does EXIST then RUN VIA CMD /C the command: rename "D:\Macro\MMM_10.txt" "MMM_%string3%_%random_5-15%.txt". So if the file exists then rename the file to the value of the %STRING3% variable and also a random value between 5 and 15 using the %RANDOM_5-15% variable (﻿Random variables are covered below in the next section﻿). This reads - At X mouse position 2739 and Y mouse position 701 wait 200 milliseconds and then output words "My integer is %INTEGER%. A random is: %random_1-100000% and here is my string:%string%. So at that X and Y mouse position the value of the %INTEGER%, a %RANDOM_1-100000% value, and the value of the %STRING% variable will be typed with the text A random is: %random_1-100000% and here is my string:%string%. (Random and integer variables are covered below in the next section). INTEGER VARIABLE objects evaluate conditions based on the value of the local %INTEGER% variable in use with Mini Mouse Macro. Here the integer variable is defined as 100. More information on defining integer variables is available under the ACTION section and the heading DEFINE INTEGER VARIABLE. This reads - IF the INTEGER VARIABLE, %INTEGER%, + 2 does equal (=) the value of %INTEGER1% then DELETE the FILE located at D:\Marco\%STRING%_%INTEGER1%.mmmacro. This reads - IF the INTEGER VARIABLE, %INTEGER%, subtract (-) %INTEGER1% is greater or equal to (>=) the value of %INTEGER1% then DEFINE INTEGER VARIABLE, %INTEGER% to be the value of %INTEGER% multiple by (*) %INTEGER2%. This reads - IF the INTEGER VARIABLE, %INTEGER%, multiply by (*) 2 is less than (<) the value 100 then GOTO MACRO LINE number with the value of %RETURN%-5. More on the %RETURN% variable can found under the GOTO MACRO LINE section. This reads - IF the INTEGER VARIABLE, %INTEGER%, divided by (/) 5 is not equal to (!=) the value 5 then DEFINE INTEGER VARIABLE, %INTEGER% to be the value of 25. This reads - IF the INTEGER VARIABLE %INTEGER% IS an EVEN number then DEFINE INTEGER VARIABLE to be the current value of the variable %INTEGER1%. So the current integer variable value is 2, this is a even number (MOD 2 = 0) and evaluates to true, so now define the value of %INTEGER% to be the value of the %INTEGER1% variable . This example is similar to the IS EVEN example above however it showcases an alternative via the ELSE statement using a MODULUS match function. This reads - IF the INTEGER VARIABLE, %INTEGER%, to the power of (^) 3 is less than (<) the value 100 then DEFINE INTEGER VARIABLE, %INTEGER%to be the value of %INTEGER% + 25. This reads - IF the INTEGER VARIABLE, %INTEGER%, mod (%) %INTEGER1% is equal to (=) the value %INTEGER2% then run the action to COPY TO CLIPBOARD the value of %INTEGER% or ELSE if the value is not equal to then DEFINE INTEGER VARIABLE, %INTEGER3% to be the value of %INTEGER3% % 3. This reads - IF the INTEGER VARIABLE %INTEGER4% IS 100 then DEFINE INTEGER VARIABLE, %INTEGER%, to be the current value + 150. So the current integer variable is 100, so this condition evaluates to true, so add 150, the value of %INTEGER% is now 350. This reads - IF the INTEGER VARIABLE %INTEGER% IS NOT 100 then DEFINE INTEGER VARIABLE to be the current value - 300. So the current integer variable value is 350, and not 100 so this condition is true, now subtract that by 300. the value of %INTEGER% is now 50. This reads - IF the INTEGER VARIABLE %INTEGER% IS GREATER THAN 10 then DEFINE INTEGER VARIABLE to be the current value * 200. So the current integer variable value is 50, this is greater than 10 - the condition is true, now multiply that by 200. the value of %INTEGER% is now 10000. This reads - IF the INTEGER VARIABLE %INTEGER% IS GREATER THAN or EQUAL TO 10000 then DEFINE INTEGER VARIABLE to be the current value / 2. So the current integer variable value is 10000, this is equal to 10000 and evaluates to true, so now divide that by 2. the value of %INTEGER% is now 5000. This reads - IF the INTEGER VARIABLE %INTEGER% IS LESS THAN 10000 then DEFINE INTEGER VARIABLE to be the current value - 99999. So the current integer variable value is 5000, this is less than to 10000 and evaluates to true, so now subtract that by 99999. the value of %INTEGER% is now -94999. INTEGER VARIABLES can also be used with random numbers. These are defined using the %RANDOM% variables. Random variables can be any one single random number with %RANDOM% or a custom random number with %RANDOM_1-25%. This reads - RUN ACTION DEFINE the INTEGER VARIABLE of %INTEGER1% to be %RANDOM%. So this will define the current value of %INTEGER1% to be a random number. This reads IF the INTEGER VARIABLE of %INTEGER1% is < (less than) 10 then DEFINE INTEGER VARIABLE of %INTEGER2% to be the current value + %RANDOM_1-10% (a random value of between 1 and 10). So if the current value of %INTEGER1% is less than to then 10, add a random number between 1 and 10 to the %INTEGER2% variable. This reads - At X mouse position 2409 and Y mouse position 790 wait 200 milliseconds and they output the keypress %RANDOM_99-199%. So at that X and Y the value of the %RANDOM_99-199% variable will be typed. This will be a random number value between 99 and 199. This reads - RUN the ACTION being to WAIT SECONDS %random_30-60%. So this will wait a random amount of seconds between 30 and 60 before continuing the macro. This reads - RUN the ACTION to DEFINE STRING VARIABLE to %random_1-10000%. So the value of %STRING% will now be defined to a random value between 1 and 10000. This reads - IF the FOLDER D:\Macro does EXIST then RUN VIA CMD /K the command rename D:\macro Folder-%random_1-50%. So if that folder does exist then rename it to Folder-(random number between 1 and 50). For example it may be renamed to 'Folder-32'. This reads - At X mouse position 2409 and Y mouse position 790 wait 200 milliseconds and they output the keypress %INTEGER%. So at that X and Y the value of the %INTEGER% variable will be typed. BOOLEAN VARIABLE objects evaluate conditions based on the value of the local %BOOLEAN% variable in use with Mini Mouse Macro. There are 100 Boolean variables that can be defined. %BOOLEAN% through to %BOOLEAN99%. This reads IF the BOOLEAN VARIABLE %BOOLEAN% is TRUE then GOTO MACRO LINE Down 1 line ELSE if %BOOLEAN% is not true then GOTO MACRO LINE Up 5 from this line. The macro above makes use of INPUT BOX to declare %BOOLEAN% to YES (evaluating to TRUE) or NO (evaluating to FALSE). Line 2 if is FALSE run the MESSAGE PROMPT. At Line 3 if %BOOLEAN% is FALSE then STOP the macro. The CLIPBOARD object evaluates a condition based on the current value of the system clipboard during evaluation. This value, when referenced, is stored within the %CLIPBOARD% variable. When a file (or files) are within the system CLIPBOARD then the file path, or file paths, are stored within the %CLIPBOARD_LISTFILES% variable. If a file (or files) are copied to system CLIPBOARD then the %CLIPBOARD% variable will contain a text representation of the copied file or files. For example, if a text file is copied to the system CLIPBOARD then the contents of that text file are stored dynamically within the variable. Similarly, if a file (or files) are copied to the system CLIPBOARD then the %CLIPBOARD_LISTFILES% variable will contain a list of the file paths that are copied. This reads - IF the current CLIPBOARD value TEXT IS the value of the %INTEGER% variable then run the action to DEFINE INTEGER VARIABLE, being %INTEGER%, +1. ELSE if the clipboard text value is not the same as the value of %INTEGER% then RUN ACTION to COPY TO CLIPBOARD the value of the %INTEGER% variable. Note: TEXT IS and TEXT CONTAINS values are case sensitive (Text is not the same as TEXT). This reads - IF the current CLIPBOARD value TEXT CONTAINS the text MZ then run the action to DEFINE STRING VARIABLE, being %STRING%, the current value of the %CLIPBOARD_LISTFILES% variable. The current value of the %CLIPBOARD_LISTFILES% variable would be the currently selected file path. If the value is not MZ then skip this condition. This reads - IF the current CLIPBOARD value FILE PATH IS the value of D:\Marco\fish.txt then run the action to DELETE the FILE, being D:\Macro\fish.txt. If the current CLIPBOARD file path value is not D:\Marco\fish.txt then skip this condition. This reads - IF the current CLIPBOARD value CONTAINS A SINGLE FILE then CONTINUE. If the current CLIPBOARD value does not contains a single file, then keep looping this condition and only continue when it does contain a single file. The PIXEL COLOR object evaluates a condition based on the color of a single pixel at a specific mouse position during evaluation. This reads - IF the PIXEL COLOR, Color [R=145, G=228, B=247], at the mouse location of X:942 Y:536 matches the color (IS THE SAME R, G, B value) then run the action to WAIT 5 MINUTES. This reads - IF the PIXEL COLOR, Color [R=145, G=228, B=247], at the mouse location of X:942 Y:536 does not match the color (IS NOT THE SAME R, G, B value) then run the action CONTINUE. The macro will only continue to the next line when the pixel color does change. This reads - IF the PIXEL COLOR at mouse location X:784 and Y:602 CHANGES 2 times within 30 seconds, with a 200 milliseconds delay between changes, then run a MESSAGE PROMPT. The amount of changes to detect. A timeout value in seconds - The total time to wait for the changes. If the time expires the statement will evaluate to FALSE and continue. A value of 0 will wait until all changes have occurred. A change delay value in milliseconds - The delay value forces a delay between detecting pixel changes. This is useful to control sensitivity of pixel changes. A value of 0 will skip a delay. Choose the Pixel Color after selecting the PIXEL COLOR object. Move the mouse to the desired color or manually enter the color by clicking the text. The PIXEL RANGE object evaluates a condition based on changes in a range of pixels during evaluation. This reads - IF the PIXEL RANGE at mouse location X 2768 and Y 602, of size width 68 pixels and height 62 pixels, changes 1 times, with 0 timeout value, and with a 0 milliseconds delay time, then GOTO MACRO LINE 10. 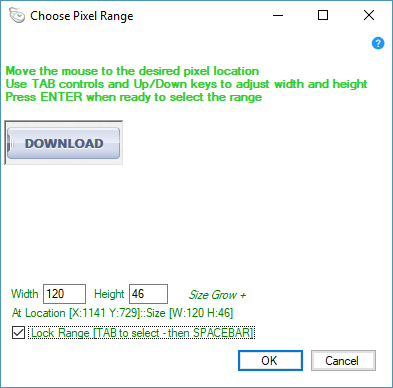 This reads - IF the PIXEL RANGE at mouse location X 2768 and Y 602, of size width 100 pixels and height 50 pixels, changes 5 times, with 0 timeout value, and with a 200 milliseconds delay time between the changes, then CONTINUE to macro. The macro will only continue until the condition successfully detects 5 changes. Move the mouse to the location of the start of the pixel range selection. The mouse position indicates the top left most pixel. Use TAB controls to enter the Width and Height text boxes manually or use the UP/DOWN keyboard arrows to adjust the Width and Height. Mouse over or click the 'Size Grow +' label to change the increment direction or use the Left/Right keyboard arrows. Use TAB controls to enter the 'Lock Range' checkbox and press SPACEBAR to lock in the pixel range. When the pixel range selection is captured press ENTER or select the OK button. The WINDOW TITLE object evaluates a condition based on the presence of a window title name. The Window Title condition is useful to check if a program window is open. This reads - IF a WINDOW with the TITLE named index.txt - Notepad does EXIST (meaning that a window is open that does have that title name) then SELECT the WINDOW BY its NAME. index.txt - Notepad. If the window title named index.txt does not exist, ELSE, then RUN the ACTION to RUN the PROGRAM at D:\Macro\index.txt opening the file. Operators are used to evaluate and determine the outcome of an object item for a condition. They determine if a condition is true or false, exist or not exist, and is successful or not successful. EXIST operators are to evaluate if file, folder, and process objects are present or running at the time of evaluation. This reads - IF the FILE c:\MMM\Process.mmmacro does EXIST then CONTINUE the macro. So if the file EXISTS meaning if it is present on the system at the time of evaluation, then continue otherwise wait until the file does exist. NOT EXIST operators are to evaluate if file, folder, and process objects are not present or not running at the time of evaluation. This reads - IF the FILE c:\log.log does NOT EXIST then RUN VIA CMD /C echo > c:\log.log. So if the file c:\log.log does not exist then run the command 'echo > c:\log.log' via a command window and then close the command window. IS operators are to evaluate objects that contain a value for comparison. This reads - IF the DATE IS 10/13/2015 then CONTINUE. So if the date matches and IS 10/13/2015 then continue running the macro, otherwise wait until the date IS 10/13/2015. IS NOT operators are to evaluate objects that contain a value for comparison. This reads - IF the FOLDER FILE COUNT in folder c:\MMM IS NOT 7 then GOTO MACRO LINE 39. So if there is not 7 files in c:\MMM then the macro will jump to line number 39 and continue. 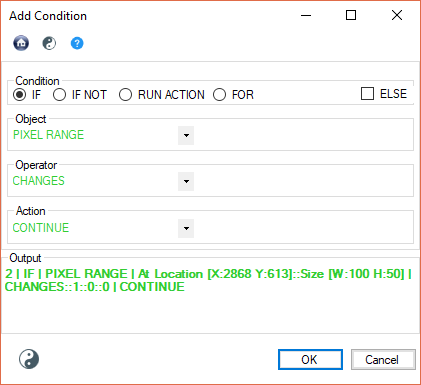 CHANGES operator is used to evaluate a change in pixel for the PIXEL COLOR and PIXEL RANGE object condition. This reads - IF the PIXEL COLOR at mouse location X 2768 and Y 602 does change 2 times, with 0 timeout value, and with a 200 milliseconds delay between changes, then CONTINUE the macro. The example above CHANGES will default to detect 1 pixel change, with no timout value. A timeout value in seconds - The total time to wait for the changes. If the time expires the statement will evaluate to FALSE and continue. A value of 0 will wait until all changes have occured. See the PIXEL COLOR or PIXEL RANGE object for more examples and uses for working with pixels. FILE CONTAINS STRING operators are to evaluate if a file object contains a string of text within the file. Strings are case sensitive. This reads - IF the FILE c:\rescue.log FILE CONTAINS STRING 'error' then KILL PROCESS ID 8732. So if the file c:\rescue.log contains the text string 'error' anywhere in the file then kill the current running process with the process ID of 8732. FILES CONTAINS STRING operators are to evaluate if a file object within a folder contains a string of text within the file. Strings are case sensitive. This reads - IF the FOLDER c:\LOGS FILES CONTAINS STRING 'error' then KILL PROCESS ID 8732. So if any file in the directory of c:\LOGS contains the text string 'error' anywhere in the file then kill the current running process with the process ID of 8732. FILES CONTAINS STRING -R operators are to evaluate if a file object within a folder tree contains a string of text within the file. The -R is 'Recursive'. Strings are case sensitive. This reads - IF the FOLDER c:\LOGS FILES CONTAINS STRING -R 'error' then KILL PROCESS ID 8732. So if any file in the entire directory tree starting from the root of c:\LOGS contains the text string 'error' anywhere in the file then kill the current running process with the process ID of 8732. CONTAINS operators evaluate the text within a variable. This operator is typically used with %STRING% variables, however is compatible with all variable types. CONTAINS is case sensitive. The macro line above is a classic example of the CONTAINS operator. Here we evaluate the contents of the string variable %STRING%. If it does contain the text '_%integer%_%string1%_' then copy the value of %string% to the system clipboard. CONTAINS operators evaluate the text within a variable. This operator is typically used with %STRING% variables, however is compatible with all variable types. CONTAINS -C is NOT case sensitive. The macro above has a FOR LOOP that iterates through each line in rx.txt. If the line (%line%) contains '_%integer%_%string1%_' then skip this line with NEXT FOR. ELSE if the line does contain the text then increment integer1 variable by 1. The macro at line 3 of the FOR LOOP evaluates the value of %integer1%. If the value if greater or equal to 50 then append to fileedits.txt with the current FOR LOOP file (rx.txt) and the value of the current line (%line%). More on FOR LOOPS here. GREATER THAN and GREATER THAN AND EQUAL TO operators are to evaluate objects that contain a value for comparison. This reads - IF the FILE SIZE of the file c:\rescue.log is GREATER THAN 96 bytes then CONTINUE. So continue if the file is larger than 96 bytes, otherwise wait until it is. This reads - IF the FOLDER FILE COUNT of folder c:\MMM is GRATER THAN EQUAL TO 7 then PAUSE. So there are 7 or more than 7 files in the folder c:\MMM then pause the current macro or else continue the macro. LESS THAN and LESS THAN OR EQUAL TO operators are to evaluate objects that contain a value for comparison. This reads - IF the FILE SIZE of the file c:\rescue.log is LESS THAN 96 bytes then CONTINUE. So continue if the file is less than 96 bytes, otherwise wait until it is. This reads - IF the MOUSE POSITION EQUALS X 996 or Y 513 is LESS THAN or EQUAL TO the current mouse X or Y then CONTINUE. So if the current mouse X is 996 or less than 996 or is the current mouse Y is 513 or less than 513 then continue, otherwise wait until it is then continue. SOURCE ADDRESS operators are to evaluate Network Packet objects source address field. This reads - IF a NETWORK PACKET DETECTED from the WIFI named adapter with the packet SOURCE ADDRESS of 192.168.0.2 then DOWNLOAD FROM URI to the folder c:\downloads the file from http://mywebsite.com/download.exe. So if a packet from source address 192.168.0.2 is read from the WIFI adapter then download a file from http://mywebsite.com/download.exe. DESTINATION ADDRESS operators are to evaluate Network Packet objects destination address field. This reads - IF a NETWORK PACKET DETECTED from the WIFI named adapter with the packet DESTINATION ADDRESS of 192.168.0.1 then CONTINUE the macro. So if a packet is detected on the adapter named WIFI with the DESTINATION address of 192.168.0.1 then continue the macro, otherwise wait until a packet with the destination is read and then continue. PACKET CONTAINS STRING operators are to evaluate Network Packet objects packet contents for matching string comparison. This reads - IF a NETWORK PACKET DETECTED from the WIFI named adapter and the PACKET CONTAINS STRING 'run_batchfile4' then RUN VIA CMD /C the command start c:\batchfile4.bat and then close the command window. So if a packet is detected from the named WIFI adapter that contains the string 'run_batchfile4' anywhere in the packet then run a command via a batch window to start c:\batchfile4.bat closing the command window after completion. PACKET TYPE TCP and PACKET TYPE UDP and PACKET TYPE ICMP operators are to evaluate Network Packet objects that match packets to a particular IP protocol. This reads - IF a NETWORK PACKET DETECTED from the WIFI named adapter and PACKET TYPE is ICMP then CONTINUE. So if a packet is detected from the named WIFI adapter that is an ICMP protocol packet then continue, otherwise wait until an ICMP packet is detected and then continue. PACKET COUNT TCP and PACKET COUNT UDP and PACKET COUNT ICMP and PACKET COUNT TOTAL operators are to evaluate Network Packet objects that match the numerical count of packets of a particular IP protocol or all packets received as the case for the PACKET COUNT TOTAL operator. This reads - IF a NETWORK PACKET DETECTED from the WIFI named adapter and PACKET COUNT ICMP is 10 then CONTINUE. So when 10 ICMP packets are detected from the named WIFI adapter then continue, otherwise keep counting ICMP packets until the count 10 is reached and then continue. PACKET SOURCE PORT NUMBER and PACKET DEST PORT NUMBER operators are to evaluate Network Packet objects that match the either a source port or destination port value. This reads - IF a NETWORK PACKET DETECTED from the WIFI named adapter and the PACKET DEST PORT NUMBER is 21 then LOAD MACRO c:\ftpbeginfiletx.mmmacro. So when a network packet is detected from the named WIFI adaptor with the destination port of 21 then load the macro file c:\ftpbeginfiletx.mmmacro. STRING FOUND operators are to evaluate Receive UDP packet string objects string comparison. This reads - IF RECEIVE UDP PACKET STRING from IP address 192.168.0.2 on UDP port 41414 with the string text of 'GOTO30' within the packet then GOTO MACRO LINE number 30. So if a UDP packet from IP 192.168.0.2 on port 41414 contains the text 'GOTO30' anywhere in the packet the the macro will jump to the macro line number 30, otherwise continue to listen and read UDP packets on that port until the string is found. Actions are what happens on the result of a matching condition. Actions are used to control macro flow or perform external tasks from outside of Mini Mouse Macro. CONTINUE action is used for macro flow control. This reads - IF the FILE c:\rescue.log does EXIST then CONTINUE the macro. So if the file is present on the system at the time of the condition evaluation then continue running the macro. The macro will only continue if the file exists. Note: Continue is a useful action to apply if you want to wait until an object is evaluated as true. Take the example above, this will only evaluate and continue to the next macro line once the file c:\rescue.log does exist. This reads - IF the FILE c:\rescue.log does CONTAIN the STRING 'Hello' then CONTINUE. Only if the word 'Hello' is within the file will the macro continue. The macro will continue to read the file on a loop until the word Hello is found. Only then will the macro continue. STOP action is used for macro flow control, to stop a running macro. This reads - IF the PROCESS ID of 2352 does NOT EXIST then STOP the macro. So if this process is not currently running during condition evaluation then the macro will stop and end, otherwise the macro will continue on. PAUSE action is used for macro flow control, to pause a running macro. This reads - IF the FILE c:\runerrors.log FILE CONTAINS STRING 'error' then pause. So if the file c:\runerrors.log contains the word 'error' anywhere in the file then the macro will pause execution, otherwise the macro will continue. CLEAR action is used for macro flow control, to clear a running macro. This reads - IF the FILE c:\MMM\End.mmmarco does EXIST then CLEAR and stop the macro. So if the file exist the macro will be cleared and stopped. EXIT action is used to immediately exit and close Mini Mouse Macro. This reads - IF the TIME of 3:09:18 PM is LESS THAN then the current time EXIT. 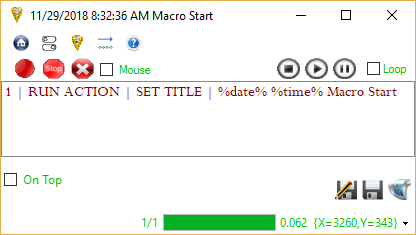 So if the current time is past 3:09:18 PM then Mini Mouse Macro will immediately close and exit, otherwise the macro will continue. EXIT FOR action is used break the current running FOR LOOP. When a EXIT FOR condition evaluates successfully the FOR LOOP will end at the next FOR NEXT statement. This reads - IF the variable %INTEGER% is GREATER THAN or EQUAL TO 9 then EXIT FOR. So if the value is greater or equal to 9 then the current running FOR LOOP iteration will end and macro flow will continue after. The example FOR LOOP above recursively iterates through each file in all folders within the e:\docs directory (FINE IN -R). Each file in the for loop evaluates line 2 Line 2 performs an IF NOT condition comparing the current file extension (%FILE.EXT%) to .txt. IF NOT the %FILE.EXT% IS .txt then EXIT FOR else RUN the ACTION to DELETE %file%. The example above breaks the FOR I loop at line 3 if the value of %i% (the current FOR counter internal variable) is greater than of equal to 5. Lines 5 and 6 clean up the cmd windows with a hard process kill (line 6). For more information on FOR loops and %FILE% variables click here. NEXT FOR action is used to skip the current FOR LOOP iteration. When NEXT FOR is run the macro immediately ends the current loop and begins the next iteration, taking the macro to the start of the next FOR LOOP. The example above has a nested FOR EACH LINE IN loop at line 3. This macro loops recursively through the folder d:\macro\tx. At line 2 the condition evaluates if the file name of the current file (%file.name%) contains the text '441'. If it does the NEXT FOR action runs and the macro skips this FOR loop taking the macro back to the start of the FOR LOOP at line 1. If the text '441' is not found in the current file name then the next FOR EACH loop runs and evaluates each line in the current %file%. The simple example above skips the FOR I loop if the internal loop counter (%i%) is equal to 3. If the counter is not 3 then a message prompt displays the value of the counter variable. DRAW creates temporary graphics on the screen. 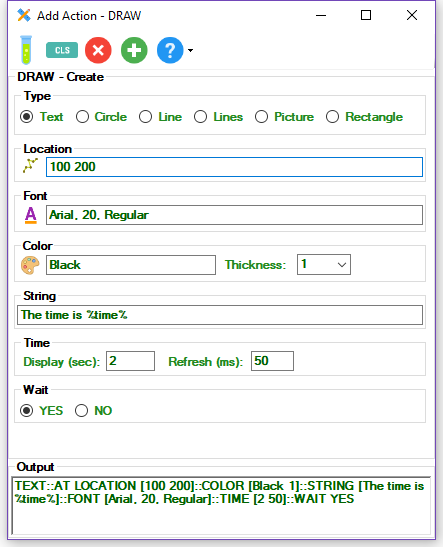 DRAW can create TEXT, PICTURES, CIRCLES, RECTANGLES, and LINES as graphics drawn temporally to the screen. In this example we create one of each of the graphic types. Notice that after the TIME value the graphics expires from the screen when the background changes behind them. DRAW actions are best added through the 'Add Condition' page. By selecting the DRAW action the 'Add Action - DRAW' wizard is displayed. SET TITLE defines the text for the macro title window. This is useful to display current values and aid in macro flow during the running macro. GOTO MACRO LINE action is used to direct the flow of the macro by jumping the macro to a specific line number or heading. GOTO MACRO LINE can also be used with the %RETURN% internal variable to control macro direction. This reads - IF the FILE, c:\running.log, FILE CONTAINS STRING 'Started' then GOTO MACRO LINE 1019. So if the file c:\running.log contains the text string 'Started' anywhere in the file then the macro will jump and continue from macro line 1019, otherwise continue the macro will continue. Remarks can be used as reference headers for GOTO MACRO LINE. This reads - IF %INTEGER% is less than the value 10 then GOTO MACRO LINE header Main or ELSE if the value of %INTEGER% is not less than 10 then GOTO MACRO LINE header End. UP and DOWN can be used as reference headers for GOTO MACRO LINE. This reads - IF %BOOLEAN% is TRUE then GOTO MACRO LINE that is Up 5 from this line or ELSE if the value of %BOOLEAN% is not TRUE then GOTO MACRO LINE that is Down 1 . Variable values can also be used to set the GOTO value. %RETURN% variable holds the line number value of the last completed macro line. This variable is useful when used with GOTO to control macro flow. Line 3: Display a message prompt that says "INTEGER is GTR than 10"
%RETURN% accepts basic math expression during evaluation. This is limited to addition (+), multiplication (*), subtraction (*), and division (/). Note: It is possible to get caught in a infinite loop if the value %RETURN%+1 is used. %RETURN%+1 is the current line, so using this value in a GOTO statement will return the flow back to the same line. If the loop is not caught through leading condition statement it will cycle infinity through the current line. LOAD MACRO action is used to control macro flow by loading and then starting a .mmmacro saved file into Mini Mouse Macro. This reads - IF the FILE C:\MMM\Macro4.mmmacro EXIST then LOAD MACRO :\MMM\Macro4.mmmacro. So if the file Macro4.mmmacro does exist then stop the current macro, load the .mmmacro file Macro4.mmmacro and then start playing the macro, otherwise continue running the macro. ADD MACRO FROM FILE action is used to add macro lines into the current running macro from a file. This appends all macro lines within the loaded file to the end of the macro, the macro is then stopped and started from the next line number after the ADD MACRO FROM FILE action. NOTE that is it important when running this action to have correctly sorted line numbers. It is recommended to run the 'relist rows' feature from the macro right click menu prior to starting the macro. This reads - IF the FILE C:\MMM\Macro4.mmmacro EXIST then ADD MACRO FROM FILE C:\MMM\Macro4.mmmacro. So if the file Macro4.mmmacro does exist then stop the current macro, add all macro lines from the file Macro4.mmmacro and then start playing the macro from where it left off, otherwise continue running the macro. WAIT MILLISECONDS, WAIT SECONDS, WAIT MINUTES and WAIT HOURS action are used to control the flow of macro execution by offering a period of milliseconds, seconds, minutes, or hours to wait until continuing. This reads - IF NOT the PROCESS ID 12116 EXIST then WAIT MINUTES 5. So if the process with process ID of 12116 does not EXIST then the macro will wait 5 minutes before continuing, otherwise If the process does exist then the macro will continue. SELECT WINDOW BY NAME action selects the open window with the title value that matches the SELECT WINDOW BY NAME value. By selecting a window it is given active scope, for example when clicking into a window that program is given active scope. This reads - RUN the ACTION SELECT WINDOW BY NAME the window title 'New Tab - Mozilla Firefox'. So this action will run and select the window with the window title 'New Tab - Mozilla Firefox'. If there is no window with that title then the condition action is skipped. SELECT WINDOW BY PROCESS ID action selects the open program window with that matches the process ID value. By selecting a window it is given active scope, for example when clicking into a window that program is given active scope. This reads - IF the PROCESS ID 10780 EXIST then SELECT the WINDOW BY its PROCESS ID of 10780. So if the process with the process ID of 10780 is active the time the condition is evaluated then select the program with that process ID. If no process ID is running that matches that ID then the condition action is skipped. DELETE FILE and DELETE FOLDER action deletes files and folders from the system. NOTE that files and folders that are deleted are permanently deleted and can not be recovered from the recycle bin. NOTE that when a folder is deleted ALL THE CONTENTS is deleted from the folder. This reads - IF the FOLDER C:\logerrors does EXIST then DELETE FOLDER c:\logerrors. So all the contents of the folder c:\logerrors will be deleted. Including all child files and folders. KILL PROCESS ID and KILL PROCESS NAME action kills current running system processes found either by the process ID value or the process name value. This reads - IF the PROCESS NAME of notepad does EXIST then KILL PROCESS with the NAME notepad. So if the notepad process exist then kill the notepad process. RUN VIA CMD /C action runs a command with a command window and then closes the command window after the command is executed. This reads - RUN ACTION RUN VIA CMD /C the command c:\batch\checklogs.bat. So the action will run and execute the command c:\batch\checklogs.bat in a command window and close the window after the command is executed. RUN VIA CMD /K action runs a command with a command window and then keeps the command window after the command is executed giving the command window focus. This reads - IF the NETWORK HOST PING REPLY to 192.168.0.2 is UNSUCCESSFUL then RUN VIA CMD /K command tracert -d 192.168.0.2. So if the host 192.168.0.2 does not reply to ICMP packets then run the tracert -d 192.168.0.2 command in a command window and keep the command window open after the command has executed. RUN PROGRAM action runs a selected program exe. This reads - IF the PROCESS ID of 6180 does NOT EXIST then RUN PROGRAM c:\logs\logaudit.exe. So if the process does not exist then execute the c:\logs\logsaudit.exe program. DOWNLOAD FROM URI action downloads a program or file to a specific location from a URI location such as the internet. This reads - RUN ACTION DOWNLOAD FROM URI to folder c:\MMM from URI http://myuploadedmacros/macro4.mmmacro. So this action will run and download the file macro4.mmmacro to the folder c:\MMM. Because no save file name has been added the file will be saved to c:\MMM with the default file name of the file which is macro4.mmmacro in this case. The WAIT option will cause the macro to wait until the file has downloaded before continuing. This reads - RUN ACTION DOWNLOAD FROM URI to folder c:\MMM from URI https://minimousemacro.com/downloads/MiniMouseMacro.exe and save the file as MMM.exe. The NO_WAIT option will not wait until the macro has downloaded before continuing the macro. SEND UDP PACKET STRING action sends a UDP packet containing a string value to a specified IP address on a specified UDP port. The SEND UDP PACKET STRING and RECEIVE UDP PACKET STRING can be used to control or monitor Mini Mouse Macro from over a network connection. NOTE that Mini Mouse Macro will need to be allowed through your local firewall for UDP packets to be sent or received by the program. Sending UDP strings can be targeted at other running Mini Mouse Macro macros on the network to trigger conditions. The MMM Controller tool can also be used to send commands to Mini Mouse Macro and to receive feedback from Mini Mouse Macro over a network. The MMM Controller can be downloaded here. This reads - IF the NETWORK HOST PING REPLY to host 192.168.0.2 is SUCCESSFUL then SEND UDP PACKET STRING to IP address 192.168.0.2 on port 41414 with string load_macro3. So is the network host 192.168.0.2 is available then send a UDP packet to that host on port 41414 containing the string text load_macro3. LOG OFF and RESTART and SHUT DOWN COMPUTER actions are used to either log off, restart or shutdown the local computer. This reads - IF RECEIVE UDP PACKET STRING from ANY IP address on port 41414 with the string RESTART then RESTART the COMPUTER. So if a UDP packet is received on port 41414 with the string RESTART then the computer will immediately restart. STRING VARIABLE objects evaluate conditions based on the value of the %STRING% variables (%STRING% through to %STRING99%) in use with Mini Mouse Macro. The DEFINE STRING VARIABLE action sets and defines the %STRING% variables for use within Mini Mouse Macro. Here the string variable %STRING% is defined as StartMacro1. More information and detailed examples on working with the %string% variables within Mini Mouse Macro is located under the STRING VARIABLE heading in the object heading.. This reads - IF the STRING VARIABLE %STRING1% IS StartMacro1 then DEFINE STRING VARIABLE, %STRING2% to be the text Macro1Process. So if the string variable %STRING1% matches exactly (evaluations are case sensitive) then change and define the variable %STRING2% to be Macro1Process. INTEGER VARIABLE objects evaluate conditions based on the value of the %INTEGER% (%INTEGER% through to %INTEGER99%) variables in use with Mini Mouse Macro. Defining variables can also be done manually from the 'Variable' settings page. Here the integer variable is defined as 100. More information and detailed examples on working with %integer% variables within Mini Mouse Macro is located under the INTEGER VARIABLE heading in the object heading section. BOOLEAN VARIABLE objects evaluate conditions based on the value of the %BOOLEAN% variables (%BOOLEAN% through to %BOOLEAN99%) in use with Mini Mouse Macro. The DEFINE BOOLEAN VARIABLE action sets and defines the %BOOLEAN% variables for use within Mini Mouse Macro. Here the string variable %BOOLEAN% is defined as TRUE. More information and detailed examples on working with the %boolean% variables within Mini Mouse Macro is located under the BOOLEAN VARIABLE heading in the object heading.. The Encrypt File/Folder and Decrypt File/Folder actions Encrypt a file or folder with AES 256 bit encryption and can un-encrypt (Decrypt) a file or folder that has been encrypted with AES 256 bit encryption. NOTE that is you forget your encryption key, is may be impossible for you to recover your encrypted files. NOTE the RECURSIVE_DIR option when encrypting/decrypting will encrypt/decrypt every file and folder starting from the chosen directory. This reads IF the FILE D:\Macro\PersonalMacro.txt does EXIST then ENCRYPT the FILE D:\Macro\PersonalMacro.txt with AES encryption. [PROMPT_AT_RUNTIME] for the encryption key (encryption passphrase) to be entered at run-time (by an input box prompt) and DELETE_ORIGINAL will delete the original un-encrypted file. As well as the options [PROMPT_AT_RUNTIME] to enter the encryption key, another option is to enter the clear text encryption key directly into the macro. Here the encryption key is entered directly as 'MyEncryptionPassword' and also the option to KEEP_ORIGINAL will not delete the original un-encrypted file. Here the action to Encrypt the file is using the %STRING% variable value as the encryption key. This reads: Perform the action to ENCRYPT the FOLDER D:\Macro with AES 256 bit encryption, PROMPT_AT_RUNTIME for the encryption key, and perform this encryption only on the root, SINGLE_DIR, of the chosen directory. Once a file has been encrypted, KEEP_ORIGINAL un-encrypted files. Each encrypted file will reside in its current directory with the file extension of .aes added to the file. Please see above under the Encrypting a File heading regarding [PROMPT_AT_RUNTIME] and options with encryption keys. As well as the options to encrypt the SINGLE_DIR (files only in the root folder) the option exist to encrypt recursively with RECURSIVE_DIR. This reads: Perform the action to ENCRYPT the FOLDER D:\Macro and [PROMPT_AT_RUNTIME] for the encryption key. Encrypt EVERY FILE IN EVERY FOLDER UNDER THE CHOSEN DIRECTORY TREE (be careful with this one) with RECURSIVE_DIR and also DELETE_ORIGINAL un-encrypted files. So with the option RECURSIVE_DIR the directory tree of D:\Macro will be encrypted. All encrypted files will be in there home directory with the file extension of .aes added. This reads: Run the action to DECRYPT the FILE D:\Macro\PersonalMacro.txt.aes with the decryption key being the value of the %STRING1% variable and after decryption DELETE_ORIGINAL, to delete the original encrypted file. So the file D:\Macro\PersonalMacro.txt.aes will be decrypted with the key value of the variable %STRING1% and then the file PersonalMacro.txt.aes will be deleted. Here, like the example above the file is decypted, however the value [PROMPT_AT_RUNTIME] ensures that the decryption key will be entered at the time of this macro condition is evaluated in the macro queue. This will be in the form of a dialog box presented. The original encrypted file will not be deleted with KEEP_ORIGINAL. This reads: Run the action to DECRYPT the FOLDER D:\Macro with the decryption key being the value of the %STRING% variable. Perform the file decryption ONLY on the contents of the root folder with the SINGLE_DIR option and DO NOT delete the original encrypted files with the KEEP_ORIGINAL option. So this action will decrypt every file encrypted that has a .aes file extension in the root directory of D:\Macro and will keep the original encrypted .aes file. Please see above under the Decrypting a File heading regarding [PROMPT_AT_RUNTIME] and options with encryption keys. This reads: Run the action DECRYPT the FOLDER D:\Macro using the decryption key of "MyDecryptionKeyPassword'. The option RECURSIVE_DIR will decypt EVERY ENCRYPTED FILE WITH THE FILE EXTENTION .AES and also DELETE_ORIGINAL will delete the original .aes encrypted files. The MESSAGE PROMPT action is a simple action that displays a message box 'OK' button with your chosen text and a chosen message box title. This action displays a message box prompt that says 'Hit OK to continue' and has the title of 'Message Prompt'. 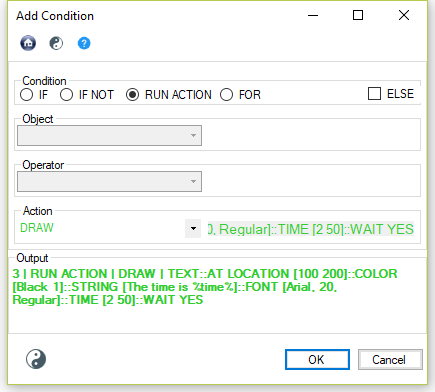 1 | RUN ACTION | MESSAGE PROMPT | String1 variable is %string1% and integer2 is %integer2%. The date is %DATE% and time is %TIME%. Don't forget %RANDOM%. This action displays a message box prompt that says 'This message prompt has a timeout value of 10 seconds' and has the title of 'Message with timeout'. After 10 seconds this message prompt will timeout as if it were clicked. Note: The value for the message title and timeout is optional. Message prompt is useful for controlling macro flow and checking variable output. The INPUT BOX action provides an input box at runtime to take input from macro users. This input can be stored into INTEGER or STRING variables for later evaluation. This reads: RUN the ACTION to prompt an INPUT BOX. The user is presented the text: 'Run Macro 1 or Macro 2'. The title of the input box is: Macro Run Selection. The value the user enters at runtime will be stored into the %INTEGER% variable. The example above (macro line 2) continues to evaluate the INTEGER variable. Assuming the user entered the value 1, the macro is directed via the GOTO MACRO LINE action to line 3. If the user entered any other value the macro is directed to GOTO MACRO LINE 200. COPY TO CLIPBOARD copies a chosen text value to the local system text clipboard. This example copies the values of %DATE%, %TIME%, %STRING%, %INTEGER1%, and %RANDOM_4-14% to be a combined string of %date%-%time%%string%%integer1%%random_4-14% and then copies this over to the system text clipboard. The string value can be any chosen text value. PASTE FROM CLIPBOARD performs a paste (effectively a CTRL+V) of the contents of the local system clipboard to the current window, or cursor, focus. This will perform the PASTE FROM CLIPBOARD action and the current contents of the system clipboard will be pasted (CTRL+V) to the object in focus. OUTPUT TO FILE outputs text to a file. The action must be passed with three values: A file name::Append/Overwrite::and the text value to output to the file. File: The file to write to output the text to. If this file does not exist, the action will create the file. If the directory home of the file does not exist, the file will not be created. Append/Overwrite: Append will add to the file. Append can be used with APPEND_NEWLINE to add a new line (a carriage return and line feed) after each append. Overwrite will overwrite all the contents of the file, effectively creating a new file with the text value output. Output: The text value to output to the file. This reads: FOR EACH FILE IN the directory of E:\docs, RUN the ACTION to OUTPUT TO the FILE '%file%' (%file% is the current file variable of the for loop iteration) and APPEND to the file the following text "[%integer%]-[%time%-%date%] %string%". The example above makes good use of a FOR FILE loop in order to loop through all the files within a directory. Each of the files in the E:\docs directory will be appended with the text values within the variables. This example loops ten times using a FOR I loop and for each loop appends with a new line the loop counter (%I%) to output.txt. The final line, after the loop finishes, opens the output.txt file. The result is a file that has the numbers 1 through 10, each on a new line. This reads: IF the FOLDER e:\docs does EXIST then OUTPUT TO the FILE at E:\docs\output-%integer%.txt and OVERWRITE the contents with %string% - COMPLETE. So in this example only if the folder exists will the OUTPUT TO FILE action take place. Also, this example uses an integer variable (%integer%) to indicate the output file name. OUTPUT TO FILE can also be used to create a VARIABLES INPUT.txt file for the INPUT FROM FILE action. The line above creates an INPUT.txt file at the file path D:\Macro\RX\INPUT.txt with all declared variables for use with the INPUT FROM FILE action. INPUT FROM FILE reads in data from a text file and assigns that data to Mini Mouse Macro variables. VARIABLES - Any variables that are declared in the input file. - To declare variables in the input file the file must be formatted correctly. NO_REFRESH - Do not monitor the file for changes. File Path: The input file path. Mini Mouse Macro is expecting a text based file. This reads INPUT FROM FILE all VARIABLES declared in D:\Macro\RX\INPUT.txt and monitor the the file for changes (REFRESH). Line 2 runs a MESSAGE PROMPT for the value of %string%. INPUT.txt declares the value of STRING to be Ants. This reads INPUT FROM FILE to the variable INTEGER declared in D:\Macro\RX\INPUT.txt and do not monitor the the file for changes (NO_REFRESH). Line 2 runs a MESSAGE PROMPT for the value of %integer%. INPUT.txt declares the value of INTEGER to be 1000.